Folded Word Press, the solid indie out of California, and the soon-to-be publisher of my novel Freight, always has something good going on. It's just what they do. These days, they're offering an extremely detailed and easy to follow FREE TUTORIAL on how to convert a highly formatted book from print to epub. Say what? I know. Find out more HERE. 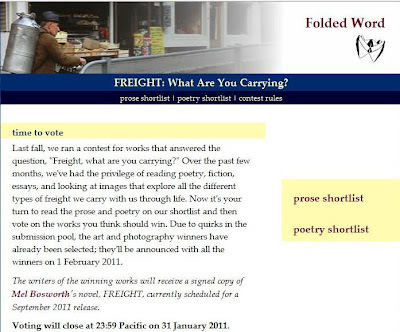 Also, the Freight Collective shortlisted works have been announced and are now ready for your votes. What's the Freight Collective? Find out more HERE, you niceface.